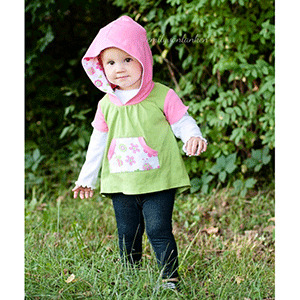 The Hazelwood Hoodie & Tunic is a fun knit top your daughter will love to wear. Two views are included- a hooded tunic with gathered neckline and pocket as well as a tunic with a simple front. Three sleeves will take this pattern from summer to winter as well as a cutting line for shirt length. 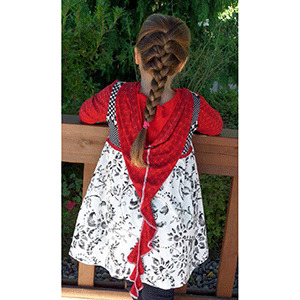 The back features a sweet gathered bodice to give your girl lots of fun twirling! Two hood options are included- standard hood and a fun pixie spiral hood! 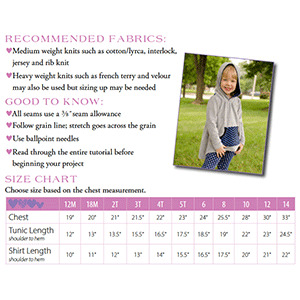 This pattern is available in sizes 12 months to 14 years. Suggested fabrics are cotton jersey, cotton lycra, cotton ribbed, or french terry.